Continuous measurement has long been viewed as a possible alternative method for collecting detailed information on the characteristics of population and housing; however, it was not considered a practical alternative to the decennial census long form until the early 1990s. At that time, demands for current, nationally consistent data from a wide variety of users led federal government policymakers to consider the feasibility of collecting social, economic, and housing data continuously throughout the decade. The benefits of providing current data, along with the anticipated decennial census benefits in cost savings, planning, improved census coverage, and more efficient operations, led the Census Bureau to plan the implementation of continuous measurement, later called the American Community Survey (ACS). After years of testing, outreach to stakeholders, and an ongoing process of interaction with key data users-especially those in the statistical and demographic communities-the Census Bureau expanded the ACS to full sample size for housing units (HUs) in 2005 and for group quarters (GQs) in 2006. The history of the ACS can be divided into four distinct stages. The concept of continuous measurement was first proposed in the 1990s. Design proposals were considered throughout the period 1990 to 1993, the design and early proposals stage. In the development stage (1994 through 1999), the Census Bureau tested early prototypes of continuous measurement for a small number of sites. During the demonstration stage (2000 to 2004), the Census Bureau carried out large-scale, nationwide surveys and produced reports for the nation, the states, and large geographic areas. The full implementation stage began in January 2005, with an annual HU sample of approximately 3 million addresses throughout the United States and 36,000 addresses in Puerto Rico. And in 2006, approximately 20,000 group quarters were added to the ACS so that the data fully describe the characteristics of the population residing in geographic areas. In 1981, Leslie Kish introduced the concept of a rolling sample design in the context of the decennial census (Kish 1981). During the time that Kish was conducting his research, the Census Bureau also recognized the need for more frequently updated data. In 1985, Congress authorized a mid-decade census, but funds were not appropriated. In the early 1990s, Congress expressed renewed interest in an alternative to the once-a-decade census. Based on Kishs research, the Census Bureau began developing continuous measurement methods in the mid-1990s. The Census Bureau developed a research proposal for continuous measurement as an alternative to the collection of detailed decennial census sample data (Alexander 1993g), and Charles Alexander, Jr. developed three prototypes for continuous measurement (Alexander 1993i). Based on staff assessments of operational and technical feasibility, policy issues, cost, and benefits (Alexander 1994e), the Census Bureau selected one prototype for further development. Designers made several decisions during prototype development. They knew that if the survey was to be cost-efficient, the Census Bureau would need to mail it. They also determined that like the decennial census, response to the survey would be mandatory and therefore, a nonresponse follow-up would be conducted. It was decided that the survey would use both telephone and personal visit nonresponse follow-up methods. In addition, the designers made critical decisions regarding the prototypes key definitions and concepts (such as the residence rule), geographic makeup, sampling rates, and use of population controls. With the objective of producing 5-year cumulations for small areas at the same level of sampling reliability as the long-form census sample, a monthly sample size of 500,000 HUs was initially suggested (Alexander 1993i), but this sample size drove costs into an unacceptable range. When potential improvements in nonsampling error were considered, it was determined that a monthly sample size of 250,000 would generate an acceptable level of reliability. Data would be collected continuously by using independent monthly samples. Three modes of data collection would be used: mailout, telephone nonresponse follow-up, and personal visit nonresponse follow-up. The survey reference date for establishing HU occupancy status, and for many characteristics, would be the day the data were collected. Certain data items would refer to a longer reference period (for example, "last week," or "past 12 months"). The surveys estimates would be controlled to intercensal population and housing estimates. All estimates would be produced by aggregating data collected in the monthly surveys over a period of time so that they would be reported annually based on the calendar year. The documentation of early development took several forms. Beginning in 1993, a group of 20 reports, known as the Continuous Measurement Series (Alexander 1992; 1993aâ1993i; 1994aâ 1994f; and 1995aâ1995b; Alexander and Wetrogan 1994; Cresce 1993), documented the research that led to the final prototype design. Plans for continuous measurement were introduced formally at the American Statistical Associations (ASA) Joint Statistical Meetings in 1995. Love et al. (1995) outlined the assumptions for a successful survey, while Dawson et al. (1995) reported on early feasibility studies of collecting survey information by telephone. Possible modifications of continuous measurement data also were discussed (Weidman et al. 1995). Operational testing of the ACS began in November 1995 at four test sites: Rockland County, NY; Brevard County, FL; Multnomah County, OR; and Fulton County, PA. Testing was expanded in November 1996 to encompass areas with a variety of geographic and demographic characteristics, including Harris County, TX; Fort Bend County, TX; Douglas County, NE; Franklin County, OH; and Otero County, NM. This testing was undertaken to validate methods and procedures and to develop cost models for future implementation; it resulted in revisions to the prototype design and identified additional areas for research. Further research took place in numerous areas, including small-area estimation (Chand and Alexander 1996), estimation methods (Alexander et al. 1997), nonresponse follow-up (Salvo and Lobo 1997), weighting in ACS tests (Dahl 1998), item nonresponse (Tersine 1998), response rates (Love and Diffendal 1998), and the quality of rural data (Kalton et al. 1998). Operational testing continued, and in 1998 three counties were added: Kershaw County, SC; Richland County, SC; and Broward County, FL. The two counties in South Carolina were included to produce data to compare with the 1998 Census Dress Rehearsal results, and Broward County was substituted for Brevard County. In 1999, testing expanded to 36 counties in 26 states (U.S. Census Bureau 2004e). The sites were selected to represent different combinations of county population size, difficulty of enumeration, and 1990â1995 population growth. The selection incorporated geographic diversity as well as areas representing different characteristics, such as racial and ethnic diversity, migrant or seasonal populations, American Indian reservations, changing economic conditions, and predominant occupation or industry types. Additionally, the Census Bureau selected sites with active data users who could participate in evaluating and improving the ACS program. Based on the results of the operational tests, revisions were made to the prototype and additional areas for research were identified. Tests of methods for the enumeration of people living in GQs also were held in 1999 and 2001. These tests focused on the methodology for visiting GQs, selecting resident samples, and conducting interviews. The tests selected GQ facilities in all 36 test counties and used the procedures developed in the prototyping stage. Results of the tests led to modification of sampling techniques and revisions to data collection methods. While the main objective of the development phase testing was to determine the viability of the methodologies utilized, it also generated usable data. Data tables and profiles were produced and released in 1999, providing data on demographic, social, economic, and housing topics. Additionally, public use microdata sample (PUMS) files were generated for a limited number of locations during the period of 1996 through 1999. PUMS files show data for a sample of all HUs, with information on the housing and population characteristics of each selected unit. All identifying information is removed and other disclosure avoidance techniques are used to ensure confidentiality. In 2000, a large-scale demonstration was undertaken to assure Congress and other data users that the ACS was capable of producing the demographic, social, economic, and housing data previously obtained from the decennial census long-form sample. The demonstration stage of the ACS was initially called the Census 2000 Supplementary Survey (C2SS). Its primary goal was to provide critical assessments of feasibility, quality, and comparability with Census 2000 so as to demonstrate the Census Bureau's ability to implement the ACS fully. Although ACS methods had been successful at the test sites, it was vital to demonstrate national implementation. Additional goals included refining procedures, improving the understanding of the cost structure, improving cost projections, exploring data quality issues, and assuring users of the reliability and usefulness of ACS data. 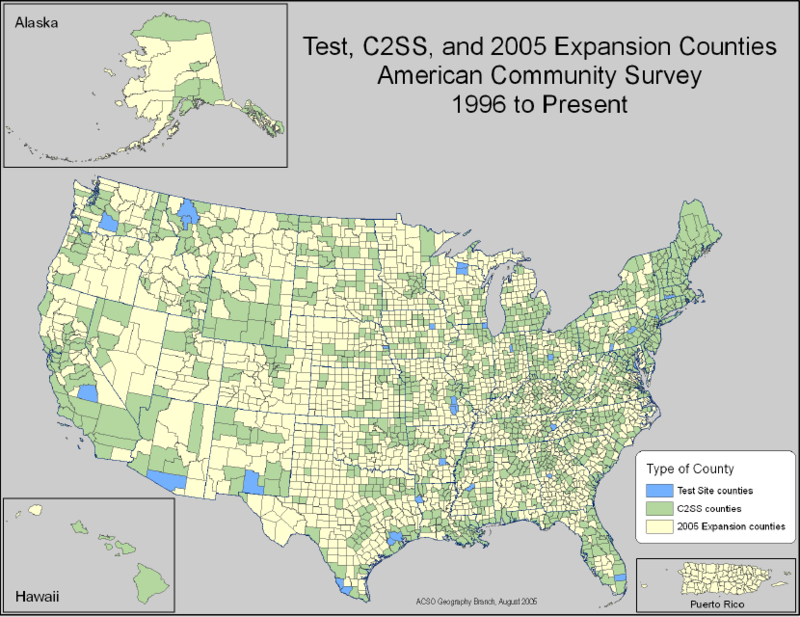 The C2SS was conducted in 1,239 counties, of which 36 were ACS test counties and 1,203 were new to the survey. It is important to note that only the 36 ACS test counties used the proposed ACS sample design. The others used a primary sampling unit stratified design similar to the Current Population Survey (CPS). The annual sample size increased from 165,000 HUs in 1999 to 866,000 HUs in 2000. The test sites remained in the sample throughout the C2SS, and through 2004 were sampled at higher rates than the C2SS counties. This made 3-year estimates from the ACS in these counties comparable to the planned 5-year period estimates of a fully implemented ACS, as well as to data from Census 2000. Eleven reports issued during the demonstration stage analyzed various aspects of the program. There were two types of reports: methodology and data quality/comparability. The methodology reports reviewed the operational feasibility of the ACS. The data quality/comparability reports compared C2SS data with the data from Census 2000, including comparisons of 3 years of ACS test site data with Census 2000 data for the same areas. Report 1 (U.S. Census Bureau 2001) found that the C2SS was operationally successful, its planned tasks were completed on time and within budget, and the data collected met basic Census Bureau quality standards. However, the report also noted that certain areas needed improvement. Specifically, due to their coinciding with the decennial census, telephone questionnaire assistance (TQA) and failed-edit follow-up (FEFU) operations were not staffed sufficiently to handle the large workload increase. The evaluation noted that the ACS would improve planning for the 2010 decennial census and simplify its design, and that implementing the ACS, supported by an accurate Master Address File (MAF) and Topologically Integrated Geographic Encoding and Referencing (TIGER®) database, promised to improve decennial census coverage. Report 6 (U.S. Census Bureau 2004c) was a follow-up evaluation on the feasibility of utilizing data from 2001 and 2002. The evaluation concluded that the ACS was well-managed, was achieving the desired response rates, and had functional quality control procedures. Report 2 (U.S. Census Bureau 2002) concluded that the ACS would provide a reasonable alternative to the decennial census long-form sample, and added that the timeliness of the data gave it advantages over the long form. This evaluation concluded that, while ACS methodology was sound, its improvement needed to be an ongoing activity. A series of reports compared national, state, and limited substate 1-year period estimates from the C2SS and Census 2000. Reports 4 and 10 (U.S. Census Bureau 2004a; 2004g) noted differences; however, the overall conclusion was that the research supported the proposal to move forward with plans for the ACS. Report 5 (U.S. Census Bureau 2004b) analyzed economic characteristics and concluded that estimates from the ACS and the Census 2000 long form were essentially the same. Report 9 (U.S. Census Bureau 2004f) compared social characteristics and noted that estimates from both methods were consistent, with the exceptions of disability and ancestry. The report suggested the completion of further research on these and other issues. A set of multiyear period estimates (1999â2001) from the ACS test sites was created to help demonstrate the usability and reliability of ACS estimates at the county and census tract geographic levels. Results can be found in Reports 7 and 8 (U.S. Census Bureau 2004d; 2004e). These comparisons with Census 2000 sample data further confirmed the comparability of the ACS and the Census 2000 long-form estimates and identified potential areas of research, such as variance reduction in subcounty estimates. At the request of Congress, a voluntary methods test also was conducted during the demonstration phase. The test, conducted between March and June of 2003, was designed to examine the impact that a methods change from mandatory to voluntary response would have on mail response, survey quality, and costs. Reports 3 and 11 (U.S. Census Bureau 2003b; 2004h) examined the results. These reports identified the major impacts of instituting voluntary methods, including reductions in response rates across all three modes of data collection (with the largest drop occurring in traditionally low response areas), reductions in the reliability of estimates, and cost increases of more than $59 million annually. In 2003, with full implementation of the ACS approaching, the American Community Survey Office (ACSO) came under the direction of the Associate Director for the Decennial Census. While the Census Bureau's original plan was to implement the ACS fully in 2003, budget restrictions pushed back full HU implementation of the ACS and PRCS to January 2005. The GQ component of the ACS was implemented fully in January 2006. With full implementation, the ACS expanded from 1,240 counties in the C2SS and ACS test sites to all 3,141 counties in the 50 states and the District of Columbia, and to all 78 municipios in Puerto Rico (Figure 2.1). The annual ACS sample increased from 800,000 addresses in the demonstration phase to 3 million addresses in full implementation. Workloads for all ACS operations increased by more than 300 percent. Monthly mailouts from the National Processing Center (NPC) went from approximately 67,000 to 250,000 addresses per month. Telephone nonresponse follow-up workloads, conducted from three telephone call centers, expanded from 25,000 calls per month to approximately 85,000. More than 3,500 field representatives (FR's) across the country conducted follow-up visits at 40,000 addresses a month, up from 1,200 FR's conducting follow-ups at 11,000 addresses each month in 2004. And, approximately 36,000 addresses in Puerto Rico were sampled every year, using the same three modes of data collection as the ACS. Beginning in 2006, the ACS sampled 2.5 percent of the population living in GQs. This included approximately 20,000 GQ facilities and 195,000 people in GQs in the United States and Puerto Rico. With full implementation beginning in 2005, population and housing profiles for 2005 first became available in the summer of 2006 and have been available every year thereafter for specific geographic areas with populations of 65,000 or more. Three-year period estimates, reflecting combined data from the 2005-2007 ACS, will be available for the first time late in 2008 for specific areas with populations of 20,000 or more, and 5-year period estimates, reflecting combined data from the 2005-2009 ACS, will be available late in 2010 for areas down to the smallest block groups, census tracts, and small local governments. Beginning in 2010, and every year thereafter, the nation will have a 5-year period estimate available as an alternative to the decennial census long-form sample; this will serve as a community information resource that shows change over time, even for neighborhoods and rural areas. Consultations with stakeholders began early in the ACS development process, with the goals of gaining feedback on the overall approach and identifying potential pitfalls and obstacles. Stakeholders included data users, federal agencies, and others with an interest in the survey. A wide range of contacts encompassed federal, state, tribal, and local governments, advisory committees, professional organizations, and other data users at many levels. These groups provided their insights and expertise to the staff charged with developing the ACS. The Census Bureau established special-purpose advisory panels in partnership with the Committee on National Statistics of the National Academies of Science (NAS) to identify issues of relevance in survey design. The ACS staff undertook meetings, presentations, and other activities to support the ACS in American Indian and Alaska Native areas. These activities included meetings with tribal officials and liaisons, attendance at the National Conference of American Indians, and continued interactions with the Advisory Committee for the American Indian and Alaska Native Populations. A Rural Data Users Conference was held in May 1998 to discuss issues of concern to small areas and populations. Numerous presentations were made at annual meetings of the ASA and other professional associations. Data users also were given opportunities to learn more about the ACS through community workshops held during the development phase. From March 1996 to November 1999, 31 town hall style meetings were held throughout the country, with more than 600 community members attending the meetings. A series of three regional outreach meetings, in Dallas, TX; Grand Rapids, MI; and Seattle, WA, was held in mid-2004, with an overall attendance of more than 200 individuals representing data users, academicians, the media, and local governments. Meetings with the Decennial Census Advisory Committee, the Census Advisory Committee of Professional Associations, and the Race and Ethnic Advisory Committees provided opportunities for ACS staff to discuss methods and receive specific advice on methods and procedures to improve the quality of the survey and the value of the ACS data. The Census Bureau's Field Division Partnership and Data Services Staff and regional directors all played prominent roles in communicating the message of the ACS. These groups provided valuable input to the decision-making process. Further, the ACS staff regularly briefed several oversight groups, including the Office of Management and Budget (OMB), the Government Accountability Office (GAO), and the Inspector General of the U.S. Department of Commerce (DOC). The Census Bureau also briefed Congress regularly on multiple aspects of the ACS; these briefings began during the early stages of the ACS and continued on a regular basis. Changes based on stakeholder input were important in shaping the design and development of the ACS and continue to influence its future form, including questionnaire content and design. For example, a "Symposium on the ACS: Data Collectors and Disseminators" took place in September 2000. It focused on the data uses and needs of the private sector. A periodic newsletter, the ACS Alert , was established to share program information and solicit feedback. The Interagency Committee for the ACS was formed in 2000 to discuss the content and methods of the ACS and how the survey meets the needs of federal agencies. In 2003, the ACS Federal Agency Information Program was developed to ensure that federal agencies having a current or potential use for data from the ACS would have the assistance they need in using the data. In 2007, the Committee on National Statistics issued an important report, "Using The American Community Survey: Benefits and Challenges," which reflected the input of many stakeholders and addressed the interpretation of ACS data by a wide variety of users. Finally, the Census Bureau senior leadership, as well as the ACS staff, routinely participated in conferences, meetings, workshops, and panels to build support and understanding of the survey and to ensure that users needs and interests were being met. Efforts were also made toward the international sharing of the Census Bureau's experiences with the development and implementation of the ACS. Presentations were given to many international visitors who came to the Census Bureau to learn about surveys and censuses. Papers were shared and presentations have been made at many international conferences working sessions and meetings. Outreach to stakeholders was a key component of launching and gaining support for the ACS program, and its importance and prominence continue. Alexander, C. H. (1992). " An Initial Review of Possible Continuous Measurement Designs." Internal Census Bureau Reports CM-2. Washington, DC: U.S. Census Bureau, 1992. Alexander, C. H. (1993a). "A Continuous Measurement Alternative for the U.S. Census." Internal Census Bureau Reports CM-10. Washington, DC: U.S. Census Bureau, 1993. Alexander, C. H. (1993b). "Determination of Sample Size for the Intercensal Long Form Survey Prototype." Internal Census Bureau Reports CM-8. Washington, DC: U.S. Census Bureau, 1993. Alexander, C. H. (1993c). "Including Current Household Surveys in a ' Cumulated Rolling Sample Design." Internal Census Bureau Reports CM-5. Washington, DC: U.S. Census Bureau, 1993. Alexander, C. H. (1993d). "Overview of Continuous Measurement for the Technical Committee." Internal Census Bureau Reports CM-4. Washington, DC: U.S. Census Bureau, 1993. Alexander, C. H. (1993e). "Overview of Research on the ' Continuous Measurement Alternative for the U.S. Census." Internal Census Bureau Reports CM-11. Washington, DC: U.S. Census Bureau, 1993. Alexander, C. H. (1993f). "Preliminary Conclusions About Content Needs for Continuous Measurement." Internal Census Bureau Reports CM-6. Washington, DC: U.S. Census Bureau, 1993. Alexander, C. H. (1993g). "Proposed Technical Research to Select a Continuous Measurement Prototype." Internal Census Bureau Reports CM-3. Washington, DC: U.S. Census Bureau, 1993. Alexander, C. H. (1993h). "A Prototype Design for Continuous Measurement." Internal Census Bureau Reports CM-7. Washington, DC: U.S. Census Bureau, 1993. Alexander, C. H. (1993i). "Three General Prototypes for a Continuous Measurement System." Internal Census Bureau Reports CM-1. Washington, DC: U.S. Census Bureau, 1993. Alexander, C. H. (1994a). "An Idea for Using the Continuous Measurement (CM) Sample as the CPS Frame." Internal Census Bureau Reports CM-18, Washington, DC: U.S. Census Bureau, 1994. Alexander, C. H. (1994b). "Further Exploration of Issues Raised at the CNSTAT Requirements Panel Meeting." Internal Census Bureau Reports CM-13. Washington, DC: U.S. Census Bureau, 1994. Alexander, C. H. (1994c). "Plans for Work on the Continuous Measurement Approach to Collecting Census Content." Internal Census Bureau Reports CM-16. Washington, DC: U.S. Census Bureau, 1994. Alexander, C. H. (1994d). "Progress on the Continuous Measurement Prototype." Internal Census Bureau Reports CM-12. Washington, DC: U.S. Census Bureau, 1994. Alexander, C. H. (1994e). "A Prototype Continuous Measurement System for the U.S. Census of Population and Housing." Internal Census Bureau Reports CM-17. Washington, DC: U.S. Census Bureau, 1994. Alexander, C. H. (1994f). "Research Tasks for the Continuous Measurement Development Staff." Internal Census Bureau Reports CM-15. Washington, DC: U.S. Census Bureau, 1994. Alexander, C. H. (1995a). "Continuous Measurement and the Statistical System." Internal Census Bureau Reports CM-20. Washington, DC: U.S. Census Bureau, 1995. Alexander, C. H. (1995b). "Some Ideas for Integrating the Continuous Measurement System into the Nations System of Household Surveys." Internal Census Bureau Reports CM-19. Washington, DC: U.S. Census Bureau, 1995. Alexander, C. H., S. Dahl, and L. Weidmann (1997). "Making Estimates from the American Community Survey." Paper presented to the Annual Meeting of the American Statistical Association (ASA), Anaheim, CA, August 1997. Alexander, C. H. and S. I.Wetrogran (1994). "Small Area Estimation with Continuous Measurement: What We Have and What We Want." Internal Census Bureau Reports CM-14. Washington, DC: U.S. Census Bureau, 1994. Chand, N. and C. H. Alexander (1996). "Small Area Estimation with Administrative Records and Continuous Measurement." Presented at the Annual Meeting of the American Statistical Association, 1996. Cresce, Art (1993). "' Final Version of JAD Report and Data Tables from Content and Data Quality Work Team." Internal Census Bureau Reports CM-9. Washington, DC: U.S. Census Bureau, 1993. Dahl, S. (1998a). "Weighting the 1996 and 1997 American Community Surveys." Presented at American Community Survey Symposium, 1998. Dahl, S. (1998b). "Weighting the 1996 and 1997 American Community Surveys. "Proceedings of the Survey Research Methods Section, Alexandria, VA: American Statistical Association, 1998, pp.172â177. Dawson, Kenneth, Susan Love, Janice Sebold, and Lynn Weidman (1995). "Collecting Census Long Form Data Over the Telephone: Operational Results of the 1995 CM CATI Test." Presented at 1996 Annual Meeting of the American Statistical Association, 1995. Kalton, G., J. Helmick, D. Levine, and J. Waksberg (1998). "The American Community Survey: The Quality of Rural Data, Report on a Conference." Prepared by Westat, June 29, 1998. Kish, Leslie (1981). "Using Cumulated Rolling Samples to Integrate Census and Survey Operations of the Census Bureau: An Analysis, Review, and Response." Washington, DC: U.S. Government Printing Office, 1981. Love, S., C. Alexander, and D. Dalzell (1995). "Constructing a Major Survey: Operational Plans and Issues for Continuous Measurement." Proceedings of the Survey Research Methods Section. Alexandria, VA: American Statistical Association, pp.584â589. Love, S. and G. Diffendal (1998). "The 1996 American Community Survey Monthly Response Rates, by Mode." Presented to the American Community Survey Symposium, 1998. Salvo, J. and J. Lobo (1997). "The American Community Survey: Non-Response Follow-Up in the Rockland County Test Site." Presented to the Annual Meeting of the American Statistical Association, 1997. Tersine, A. (1998). "Item Nonresponse: 1996 American Community Survey." Paper presented to the American Community Survey Symposium, March 1998. U.S. Census Bureau (2001). "Meeting 21st Century Demographic Data Needs-Implementing the American Community Survey: July 2001, Report 1: Demonstrating Operational Feasibility." Washington, DC, July 2001. U.S. Census Bureau (2002b). "Meeting 21st Century Demographic Data Needs-Implementing the American Community Survey: May 2002, Report 2: Demonstrating Survey Quality." Washington, DC, May 2002. U.S. Census Bureau (2003b). "Meeting 21st Century Demographic Data Needs-Implementing the American Community Survey: Report 3: Testing the Use of Voluntary Methods." Washington, DC, December 2003. U.S. Census Bureau (2004a). "Census 2000 Topic Report No. 8: Address List Development in Census 2000." Washington, DC, 2004. U.S. Census Bureau (2004a). "Meeting 21st Century Demographic Data Needs-Implementing the American Community Survey: Report 4: Comparing General Demographic and Housing Characteristics With Census 2000." Washington, DC, May 2004. U.S. Census Bureau (2004a). Meeting 21st Century Demographic Data Needs-Implementing the American Community Survey, Report 6: The 2001â2002 Operational Feasibility Report of the American Community Survey. Washington, DC, 2004. U.S. Census Bureau (2004b). Meeting 21st Century Demographic Data Needs-Implementing the American Community Survey: Report 5: Comparing Economic Characteristics With Census 2000. Washington, DC, May 2004. U.S. Census Bureau (2004b). Meeting 21st Century Demographic Data Needs-Implementing the American Community Survey: Report 7: Comparing Quality Measures: The American Community Surveys Three-Year Averages and Census 2000s Long Form Sample Estimates. Washington, DC, June 2004. U.S. Census Bureau 2004c. Housing Recodes 2004. Internal U.S. Census Bureau data processing specification, Washington, DC. U.S. Census Bureau (2004e). Meeting 21st Century Demographic Data Needs-Implementing the American Community Survey: Report 8: Comparison of the ACS 3-year Average and the Census 2000 Sample for a Sample of Counties and Tracts. Washington, DC, June 2004. U.S. Census Bureau (2004f). Meeting 21st Century Demographic Data Needs-Implementing the American Community Survey: Report 9: Comparing Social Characteristics with Census 2000. Washington, DC, June 2004. U.S. Census Bureau (2004g). Meeting 21st Century Demographic Data Needs-Implementing the American Community Survey: Report 10: Comparing Selected Physical and Financial Housing Characteristics with Census 2000. Washington, DC, July 2004. U.S. Census Bureau (2004h). Meeting 21st Century Demographic Data Needs-Implementing the American Community Survey: Report 11: Testing Voluntary Methods-Additional Results. Washington, DC, December 2004.